The 19th Annual SLOAN Consortium International Conference on Online Learning (did you notice…I said NINETEENTH) kicked off today. Our keynoter this afternoon brought our attention to the fact that SLOAN has been fostering a conversation about online learning for 19 years. With the Year of the MOOC last year notwithstanding, online learning was not discovered last year! But more on that in a moment. Today, I attended three information sessions and the keynote address. As usual, I was active on Twitter using the hashtag #aln13, so one can get a sense of the proceedings by following the very active tweet stream. @bwatwood I use the Community of Inquiry survey as a guide for faculty development related to course delivery/teaching online. I hope to connect with Phylise later to learn more! My second session was with Steve Ehrmann and others from George Washington University, on Six Design Features of Distinguished Online Programs. At VCU, we are committed to creating online courses and programs that are “distinctive”, so I wondered how Steve approached this. He noted that the proliferation of online offerings nationally has led to commodity online education. Learners have access to dozens of programs that are indistinguishable from each other. They end up competing on size and sizzle. Like any technological advance, there are positives and negatives. Depending on audience, online education has increased quality in some programs and seen it decreases in others. For some, online education has increased access while potentially denying it to the poor, disabled, or remote populations. Steve suggested that new programs need to be both exceptionally good and perceived by constituents as exceptionally good. Recruit a dream team to develop and teach the program. With a hybrid approach, exploit “place” in online programs (though place does not necessarily mean on campus). Find corporate partners to help make the program distinctive. Take advantage of scale to create customized learning for each student. Use small group synchronous activities to create tight bonds with students. Educate students to thrive in a hybrid digital workforce. Our excitement of the day came just as Steve’s session was ending, when the hotel fire alarm sounded. Luckily for those presenting, it was a short lived false alarm, but it cut a few minutes into my third session. Shanna Jaggars discussed recent research into online learning. She noted that many reference the DoE Meta-analysis study published in 2009, that that study really only looked at 7 research studies of full online courses at four-year institutions. These studies tended to research small class-size courses at elite institutions. Her Center for Community College Research attempted to dig deeper at more traditional online students by exploring success in two-year college online courses in Virginia and Washington states. Her study of 23 courses at two Virginia community colleges using student interviews raised an unexpected issue of students complaining that they really did not know their teachers nor feel their presence in class. For me, I would question whether this is a factor of “online learning” or one of how teachers are selected, assigned, and supported in teaching online. Shanna ended her session by suggesting that online teaching and learning could be improved through the conscious use of faculty inquiry and the scholarship of teaching online. One-oft workshops were not the answer. Totally agree here, and our CTE Online programs do attempt to integrate the research and the practical aspects of teaching online. Hal Plotkin of the U.S. Department of Education was our keynoter. He discussed how online learning aligned with President Obama’s goals for improving education in America. In a somewhat rags to riches story, he discussed his own background and how one event changed his life and led to a career in newspapers after first dropping out of (or as he noted, being pushed out of) high school, then eventually obtaining an Associates degree and Bachelors degree. He noted that currently, only 7% of the world’s population go on to some college, and that meant the 93% were a hugely untapped potential. His admonition to us was not to further prop open the door of access to higher education, but to blow the hinges off that door! 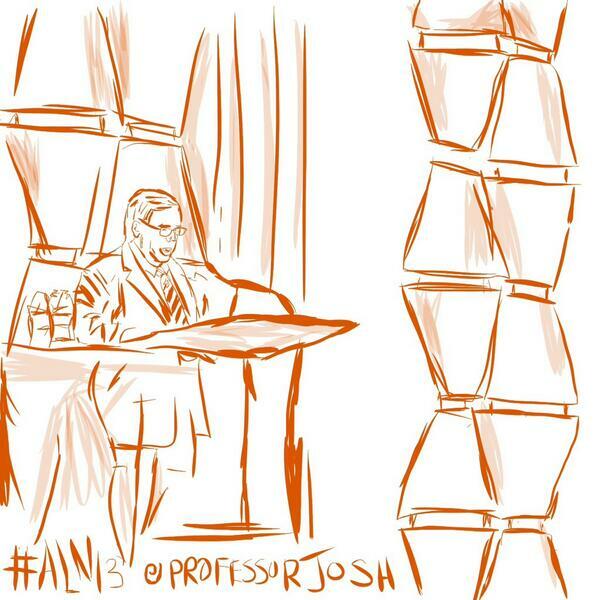 As Plotkin was talking, Josh Murdock tweeted the above sketch on Twitter. I thought it was pretty cool and wondered if he had done this on an iPad? Some tweets were pretty snarky regarding Plotkin’s message, but it resonated with me that he called for more open access, more sharing of resources, and less judging of current experiments. He noted that the current set of MOOCs were the Model T’s of online learning…with better cars on the way. He also noted that in the rush to develop online programs, we needed to keep the law of the land regarding ADA and accessibility front and center. The day ended with the awarding of this year’s SLOAN-C Fellow Awards. It was most gratifying to see my good friend and colleague Bill Pelz of Herkimer County Community College recognized with this national award! I’m very interested in Steve Ehrmann’s recommendation to “Use small group synchronous activities to create tight bonds with students.” Particularly, I’d like to hear about the various systems that allow student groups to change in a course.